Standing twelve feet tall, this powerfully muscled, bipedal creature has tough, leathery skin the color of dry earth, and a long tail that lashes slowly behind it. The creature's fingers end in wicked, foot-long claws that look capable of easily rending flesh from bone. The deathclaw is a fearsome predator selectively bred and engineered as a species long ago for its killing potential. 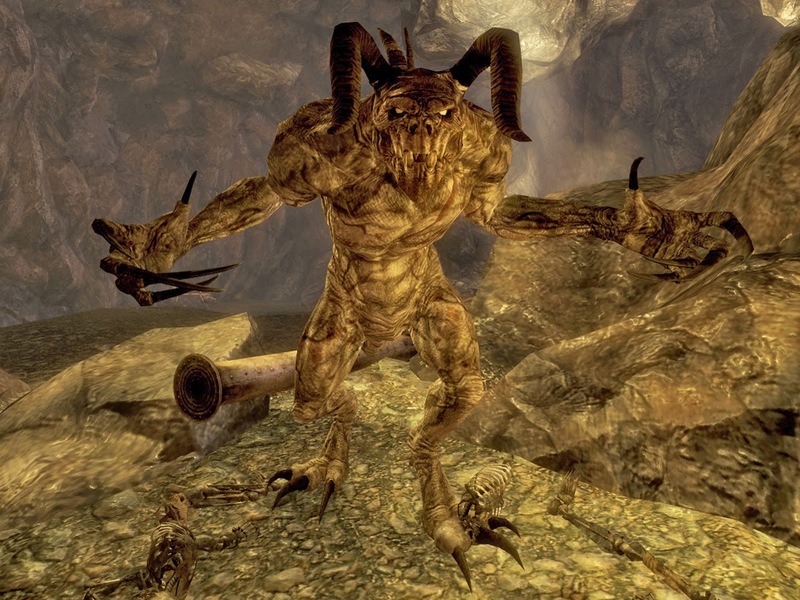 Standing at twice the height of a man, a deathclaw's posture is stooped down so that its knuckles nearly touch the ground, to roughly a height of nine or ten feet. A deathclaw sometimes moves on all fours, but walks primarily upright, using its long, sinuous tail for balance. Deathclaws are highly territorial carnivores that kill any creatures that enter their domain. Due to their engineered nature, deathclaws will stalk and kill prey far from their nests even when not in need of food. A typical female deathclaw can lay up to twelve eggs in a single clutch which are impregnated by a sole alpha deathclaw (a male deathclaw with the advanced creature and giant creature templates). Young deathclaws mature to adulthood within six months, though less than half of a deathclaw clutch typically survives to adulthood in the wild. Most of these young deaths come from the territorial and aggressive nature of deathclaws, leading to males vying for territory and status killing the young of rival alpha males. Deathclaws were created long ago by the fleshforgers of Nex to use as living weapons in the war with Geb. The first deathclaws were bred with capability for rapid maturation and with highly volatile, aggressive personalities. They were intended to be smuggled into Geb as eggs, only to hatch and slaughter populations wholesale. Ultimately the project was scrapped before the first deathclaws were introduced to Geb, as it was discovered their breeding rate had escalated out of control. Most of the first-generation deathclaws were killed in captivity, but some managed to escape from Oenopion and eluded capture by fleeing into the Mana Wastes. Here the deathclaws adapted to the hostile environment of the wastes and grew in both size and intelligence. Due to the scarcity of food in the wastes, some packs of voracious deathclaws eventually migrated west into the Mwangi expanse and followed the mountains bordering eastern Garund all the way into Katapesh and Osirion. In the latter case, they came to settle the craggy and perilous Footsteps of Rovagug in southwestern Osirion. While deathclaws are capable of understanding basic speech they do not possess the necessary vocal cords to produce language. However, some possess a mutation that allows them to mimic speech much the same as a parrot does. Due to their time in the mana wastes, deathclaws have developed distinct mutations unique to their kind. For more varied and more exotic deathclaws, you may apply the mana wastes mutant template from the Pathfinder Campaign Setting book, "Inner Sea Bestiary." Sound Mimicry (Ex) Some deathclaws are excellent at learning and copying sounds they hear often, from creaking boards to even specific voices. The deathclaw makes a Bluff check opposed by the listener’s Sense Motive check to recognize the mimicry, although if the listener isn’t keenly familiar with the person or type of sounds mimicked, it takes a –8 penalty on its Sense Motive check. The deathclaw has a +8 racial bonus on its Bluff check to mimic sounds it has listened to for at least 1 week. This ability does not allow the deathclaw to speak. Female deathclaws are exceedingly rare but are dreadful scourges to any environment due to their ability to lay dozens of deathclaw eggs at one time. A single female deathclaw is present in any one pack at a time, with another female taking her place when she dies. Deathclaw matriarchs reduce their speed by 10 feet due to their bulbous midsection laden with eggs. They also receive the deathclaw frenzy ability. Deathclaw Frenzy (Ex) If a mother deathclaw is brought below half her maximum hit points, or witnesses any present young deathclaws or deathclaw eggs take damage, she immediately enters a deathclaw frenzy. This state lasts for 1 minute and grants the mother deathclaw a +6 morale bonus to Strength and Constitution, a +30 foot enhancement bonus to speed, and DR 10/—. When the deathclaw frenzy ends, the mother deathclaw is exhausted until she receives 8 hours of rest.